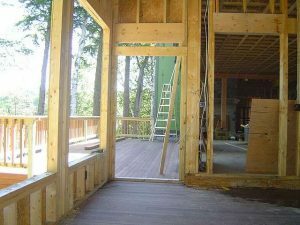 Putting on a house addition is a major endeavor that requires a lot of thought prior to breaking ground. Building a home addition is akin to building a small home, with the added complication of having to attach it directly to the side of your existing home. Deciding whether or not you should put on a house addition involves understanding the total cost of construction, the time required to build it, the hassles and disruptions associated with building it, and the expected return on investment from it. If after doing your due diligence and feeling comfortable with the responses to these questions you can then move forward with eyes wide open. Building a house addition is typically less expensive than selling your home and buying a new and larger one. Just the closing costs alone, with the selling of the old home and the buying of the new one, can often be financial justification enough to build the house addition. Building a house addition also eliminates the need for transplanting the family into possibly a new town and school system. A moderately finished home addition traditionally has an excellent return on investment. For most homeowners who hold onto their home for a few years, after completing the house addition, fully recoup the house addition costs and in some cases achieve a positive rate of return. Building a house addition also enables you to put your creative juices to work. As the homeowner, you have the complete flexibility to design the house addition as you see fit. Moreover, with complete design control, you can also control house addition construction costs. Building a house addition is very expensive. On a cost per square foot basis it typically costs more than a brand new home construction. The reason for this is that the house addition has to tie into the existing home which often involves some demolition and reconstruction of the existing home. You may not necessarily get your money back when building a home addition, particularly if you’ve put too many high end features in it. Also if the home addition doesn’t aesthetically complement the rest of the home, the overall home could lose its original curb appeal, which again could negatively impact the value of the home. Building a house addition is a major disruption to the family. Contractors showing up every morning at 6am and traipsing all over your yard, and possibly into your home, can be annoying to say the least. Then there’s all the dirt and dust to contend with, along with the constant sounds of hammering and power tools running. Putting on a house addition also consumes some of your yard. This can be particularly of concern if you have a small lot. Keep in mind, once the house addition is built, the land is forever lost, unless you tear the addition down. 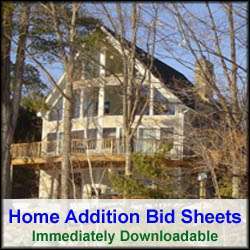 For more help on building a house addition, see HomeAdditionPlus.com’s Home Addition Bid Sheets. Our Home Addition Bid Sheets provide you with the knowledge and information on how to plan a home building project, and what to look for when hiring contractors. They also include detailed cost breakdown tables and spreadsheets for estimating your own new home construction building costs.